Brexit dominated the debate at the congress of Britain's trade union federation, the Trade Union Congress (TUC). Throughout the first few days of the congress, it became clear that sections of the TUC leadership are seeking to align the TUC with those demanding a second referendum to overturn the 2016 vote to leave the European Union (EU). 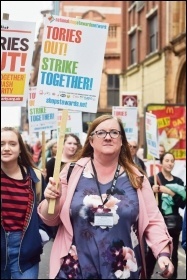 Scandalously, TUC general secretary Frances O'Grady commented to the press along such lines, ahead of the congress even debating the issue and deciding its position. This approach of pre-empting the congress debate - and hiding behind those not looking to overturn the 2016 vote, but who are not prepared to simply accept a Brexit deal delivered by the Tories - angered many delegates. Her comments, alongside those of right-wing NUS president Shakira Martin, who was invited as a guest speaker, seemingly aimed to create pressure in the run-up to the Labour Party conference for Corbyn to change his position. The danger is that this would aid the Blairites in their aim to undermine Jeremy Corbyn. Such a position is a defence of the status quo which was rejected in 2016, a status quo that has led to low pay, zero-hour contracts, expensive but substandard housing, and public services on the brink of collapse. If that is what workers are led to believe the labour movement stands for, it could potentially push many into the arms of the right. In the congress debate, the general council speaker Steve Turner specified that this was "not a call for a second referendum" and Unite the Union general secretary Len McCluskey emphasised "this was not a vote to stay in the EU" and that "the vote we need desperately above all is a general election". But no wonder there is confusion when, as the transport union RMT general secretary Mick Cash pointed out, Frances O'Grady refuses to rule out a second referendum on membership of the EU when interviewed. The TUC general council statement also leaves the door open to remaining in the EU Single Market, without the abolition of all its neoliberal rules. The opposition of the RMT forced a debate. As Mick Cash pointed out, the TUC would be lining up with the likes of Chuka Umunna, Peter Mandelson, Tony Blair and the Lib Dems if it supported a 'people's vote' on reversing the 2016 result. As Cash explained: "It lets them off the hook because the issue becomes not what sort of Brexit we want but whether there should be a second referendum. "It lets them off the hook because what they are terrified of is not a people's vote but a general election." While TUC figures talk of "rising to the threat of a Tory attack on workers" when discussing the EU, many workers will be wondering why the TUC hasn't risen to the threat of attacks like austerity and the latest anti-union laws. 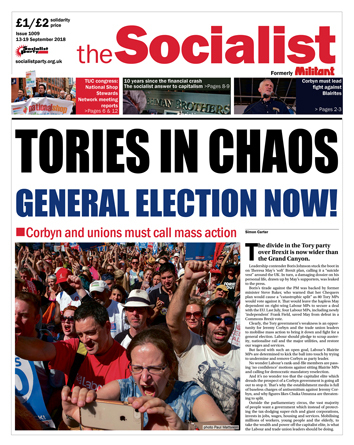 The best way to fight such attacks is to fight for coordinated action between unions against austerity, and to mobilise a movement that can kick the Tories out.